There are two main types of mobile page impression in my book. Firstly, there are page impressions of your full site, that just happen to have been visited from a mobile device. (Mobile phone or tablet device). Secondly, there are page impressions of a mobile optimised site, from mobile devices. 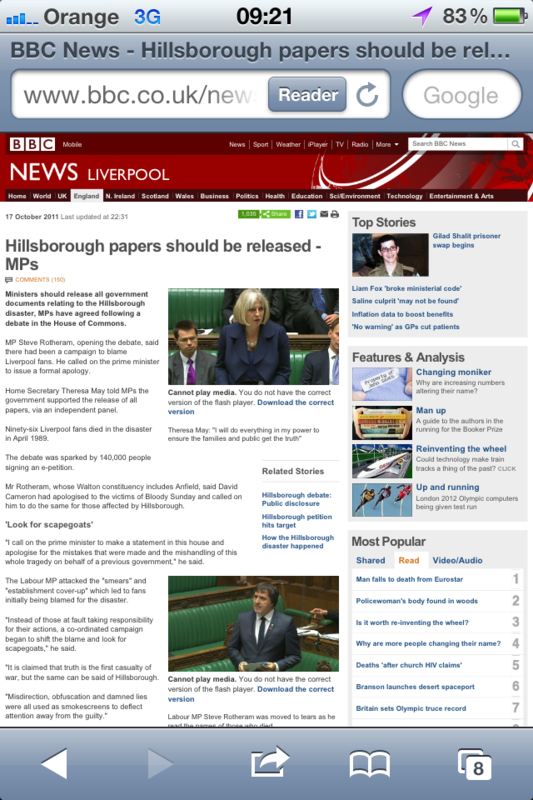 You could arguably segment further still, and say that the BBC screen grab below has been optimised for viewing on an iPhone, because it has squashed the main site into a smaller screen, but for the purposes of this article it is sufficient to concentrate just on the first two categories of page impression. If you don’t have a mobile optimised site, it is very likely that the ad-campaigns that you have set up to serve on your main site are also appearing on page impressions viewed on mobile devices. If this is the case on a tablet, this isn’t too much of an issue because full sites can look great on these devices and the size of the tablet means that the advertising still appears at a perfectly viewable size. On a mobile phone however, the advertising is scaled down so significantly, that it can be bordering on the illegible in some cases, and that is before you consider the damage that Apple’s new Reader app will cause over time. With just one click, the crowded page with a tiny font is transformed immediately into a clean, well laid out article. The problem is that Reader is essentially Apple offering their users a virtual mobile optimisation tool and the bad news is that it doesn’t take advertising with it! Reader really does enhance the users enjoyment of the text, which makes it even more important for your to build a mobile optimised site now, so you can still be in control of monetising it. If you don’t offer the user a great mobile experience, then I can see a future where Apple users read billions of page impressions ad-free! 4m iPhone 4S’s have been sold already, and it has broken all previous sales record that Apple set. That number may be a small percentage of the overall pie right now, but bear in mind that iOS users tend to use more mobile data than users on other operating systems, and that the iPhone 4S will sell a truck load more than 4m as time goes by. In summary, you either make a beautiful mobile reading experience for your users with advertising, or soon many will make that experience for themselves without advertising.